Afshari, R., Sadeghpour Gildeh, B. (2018). The effects of misclassification errors on multiple deferred state attribute sampling plan. Journal of Industrial and Systems Engineering, 11(2), 31-46. Robab Afshari; Bahram Sadeghpour Gildeh. "The effects of misclassification errors on multiple deferred state attribute sampling plan". Journal of Industrial and Systems Engineering, 11, 2, 2018, 31-46. Afshari, R., Sadeghpour Gildeh, B. (2018). 'The effects of misclassification errors on multiple deferred state attribute sampling plan', Journal of Industrial and Systems Engineering, 11(2), pp. 31-46. Afshari, R., Sadeghpour Gildeh, B. The effects of misclassification errors on multiple deferred state attribute sampling plan. Journal of Industrial and Systems Engineering, 2018; 11(2): 31-46. Multiple deferred state (MDS) sampling plan by attribute in which current lot and future lots information is utilised on sentencing submitted lot, is constructed under the assumption of perfect inspection. But sometimes the inspection may not be free of inspection errors. In this paper, we develop MDS-plan by attribute to the state where misclassification errors exist during the inspection. In the following, we consider effects of the inspection errors on operating characteristic curve, expected disposition time and average sample number (ASN) for decision in MDS- plan. In order to discuss influence of the inspection errors on these mentioned measures, we have more focus on a specific feature of MDS(0,1,2)-plan. Also, some applicable examples are given to make more understanding. The results show that accuracy and performance of MDS(0,1,2)-plan can be affected by the inspection errors. Also we show that the inspection errors not only cause the considerable difference between true and observed curves of the expected disposition time in MDS(0,1,2)-plan but also have a negative influence on the ASN curve of the mentioned plan. Afshari, R., SadeghpourGildeh, B. &Sarmad, M. (2018). Multiple deferred state sampling plan with fuzzy parameter‎.International Journal of Fuzzy Systems, 20(2), 549-557. Balamurali, S., Jeyadurga, P. & Usha, M. (2016). Designing of bayesian multiple deferred state sampling plan based on Gamma Poisson distribution. American Journal of Mathematical and Management Sciences, 35(1), 77-90. Balamurali, S. & Jun, C. H. (2007). Multiple dependent state sampling plans for lot acceptance based on measurement data. European Journal of Operational Research, 180(3), 1221-1230. Beaing, I. & Case, K. E. (1981). A wide variety of AOQ and ATI performance measures with and without inspection error. Journal of Quality Technology, 13(1), 1-9. Case, K. E., Benett, G. K. & Schmidt, J. W. (1975). The effect on inspection error on average outgoing quality.Journal of Quality Technology, 7(1), 28-33. Chen, C. H. & Chou, C. Y. (2003). Economic specification limits under the inspection error.Journal of the Chinese Institute of Industrial Engineers, 20(1), 9-13. Chen, T. T., Huang, C. P. & Lien, S. Y. (2008). Dodge-Roming rectifying single sampling plans based on inspection error. In: Proceedings of International Conference on Business and Information Management, Linkou, Taipei County, Taiwan. Collins, R. D., Case, K. E. & Bennett, G. K. (1973). The effect of inspection errors in single sampling inspection plans.International Journal of Production Research, 11(3), 289-298. Dodge, H. F. (1955). Chain sampling inspection plan.Industerial quality control, 11(4), 10-13. Dodge, H. F. & Stephens, K. S. (1966). Some new chain sampling inspection plans.Industerial quality control, 23(2), 61-67. Dorris, A. L. & Foote, B. L. (1978). Inspection errors and statistical quality control.AIIE Transactions, 10(2), 184-192. Duffuaa S. O. & El-Gaaly A. (2015). Impact of inspection errors on the formulation of a multi-objective optimization process targeting model under inspection sampling plan.Computers and Industrial Engineering, 80, 254-260. Fallahnezhad M. S. & Yousefi Babadi A. (2015). A new acceptance sampling plan using bayesian approach in the presence of inspection errors.Transactions of the Institute of Measurement and Control, 37(9), 1060-1073. 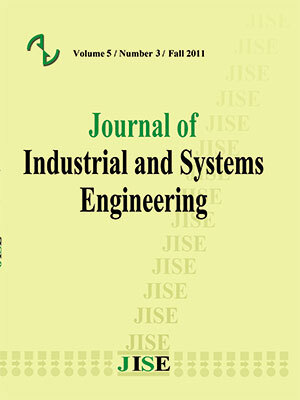 Jun C. H., Aslam M., Azam M., Balamurali S. & Rao G. S. (2014). Mixed multiple dependent state sampling plans based on process capability index.Journal of Testing and Evaluation, 43(1), 171-178. Latha M. &Subbiah K. (2015). Selection of bayesian multiple deferred state (BMDS-1) sampling plan based on quality regions.International Journal of Recent Scientific Research, 6(5), 3864-3867. Markowski, E. P.& Markowski, C. A. (2002). Improved attribute acceptance sampling plans in the presence of misclassification error.European Journal of Operational Research, 139(3), 501-510. Mogg, J. M. & Wortham, A. W. (1970). Dependent stage sampling inspection.International Journal of Production Research, 8(4), 385-395. Montgomery, D. C. (1991). Introduction to statistical quality control. New York: Wiley. Osanaiye, P. A. & Alebiosu, S. A. (1988). Effects of industrial inspection errors on some plans that utilise the surrounding lot information.Journal of Applied Statistics, 15(3), 295-304. Senthilkumar D., Ramya S. R. & Raffie B. E. (2015). Construction and selection of repetitive deferred variables sampling (RDVS) plan indexed by quality levels.Journal of Academia and Industrial Research, 3(10), 497. Soundararajan, V. & Vijayaraghavan, R. (1990). Construction and selection of multiple dependent (deferred) state sampling plan.Journal of Applied Statistics, 17(3), 397-409. Subramain, K. & Haridoss, V. (2012). Development of multiple deferred state sampling plan based on minimum risks using the weighted poisson distribution for given acceptance quality level and limiting quality level.International Journal of Quality Engineering and Technology, 3(2), 168-180. Suich, R. (1990). The effects of inspection errors on acceptance sampling for nonconformities.Journal of Quality Technology, 22(4), 314-318. Wortham, A. W.& Baker, R. C. (1976). Multiple deferred state sampling inspection.International Journal of Production Research, 14(6), 719-731. Wu C. W., Lee A. & Chen Y. (2016). A novel lot sentencing method by variables inspection considering multiple dependent state.Quality and Reliability Engineering International, 32(3), 985-994. Wu, C. W., Liu, S. W. & Lee, A. (2015). Design and construction of a variable multiple dependent state sampling plan based on process yield.European Journal Industrial engineering, 9(6), 819-838. Yan A., Liu S. & Dong X. (2016). Designing a multiple dependent state sampling plan based on the coefficient of variation.SpringerPlus, 5(1), 1447.